We have raised, or had promised, $4,600 (Mitcham Exercise Group has contributed $882 so far) towards the $5,081 required for Shipment #10 – 7 pallets of books. Being an incorporated body, we have additional running costs bringing the annual budget to run Books for Lesotho to $7,500. We need about $3,000 more this year! Your contribution is needed for 2016. We invite you to donate now! 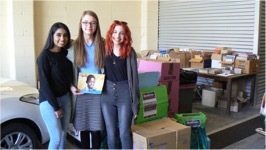 During the month of August, Y12 social studies students at The Heights School (R to Y12) at Modbury Heights sponsored a project to collect books for Books for Lesotho, thereby becoming the FIRST SCHOOL in South Australia to conduct a book drive for us. They did a great job putting up A4 posters developed by Alex Kemp exclusively for our use. Our flyers went home with primary school students, while high school kids were left to respond to information in the school newsletter. Cardboard boxes were recycled and covered with green or blue paper and placed around the school. 3 of the girls involved (with parental help) delivered the great collection to our city shed ready for immediate sorting and packing. Thanks for doing such a great job. Good luck with your Y12 exams! Thanks to the staff who supported them. The image is of Shiraz Lal, Tijana Maric and Alex Del Gaudio. Absent: Courtney Spence. Sacre Ceour, Glen Iris, Melbourne, Victoria: This school is down-sizing its library and was seeking a good home for the surplus books: “We have mainly non- fiction for senior students and some fiction too”, wrote Sharon Roth, Head of Information Services. These books have been packaged and are due to be delivered in Adelaide this week (c/- Chris McEvoy in Melbourne). Thanks to Sharon and Chris. St Peter Chanel Primary School, Regents Park, Sydney, New South Wales: This school has had a cull of books as the library changes location. Books for Lesotho has been selected to receive the books – destined for Africa, the school’s choice. Thank you librarian Sarah Sly for your efforts in coordinating the tasks. Please send us a report for the next newsletter! Mid North Christian College, Port Pirie, South Australia: “For Literacy Week this year (held during September 2016), our college are focussing on donating and creating books to give to a charity. Our Junior School classes will write, illustrate and publish approximately 80 picture books. Our Senior School students will donate a near new quality novel/picture book each (approximately 100-150 books).” So wrote Terry Edmunds, English Subject Co-ordinator. We expect these books to be delivered during the school holidays. Thank you, Terry, for your coordination. Wiley and Jacaranda Publishers, Melbourne, Victoria: As we go to print, we are pleased to report that a large shipment of books is expected soon from the Brisbane warehouse of Wiley and Jacarada. While we do not usually accept large blocks of books with the same title, we have accepted these new books along with the challenge of how best to use them in Lesotho. Our normal selection process provides a range of books to any one school. Funding of such an extra is also a challenge! We will discuss best use with our partners in Lesotho, the Transformation Resource Centre. Thank you, Wiley:Jacranda and Luke. We look forward to an on-going relationship. Prince Alfred College Preparatory School, Kent Town Adelaide: After an annual review of library stock, some books went to the Princes Emporium held on the Front Oval. Students brought a book to exchange and help renew library stock. We benefited from the remainder, now packed for Lesotho. Thank you Neil Andary, Head of the Prep. School, the librarian, and others who helped. Other inquiries: We have received numerous other enquiries through our website or through GiveNow about donating books. Many of these enquirers have been based outside of South Australia and so the cost of freight becomes an issue. One such is Epping Secondary College (Melbourne) with 25 cartons of books which could come to us. Currently we do not have an economical arrangement with a transport company, nor do we currently have funds to pay for such freight. However, we are working on the issue. Hopefully, during 2017 we will have a coordinator based in Melbourne with a team of volunteers who will be able to ship directly out of Melbourne to Lesotho. There, that’s a dream waiting to come true. Women’s Group, Mitcham: During August, Liz and David made a presentation on Lesotho and the Book Project to an independent group of women who meet in Mitcham, socialise, have a speaker, eat lunch, and appear to generally have a great time together. Ladies, thank you for your welcome, for the books donated and the donations. Mothers Union, Anglican Parish of Mitcham, Church of St Michael: On that September day of storms and flooding rain in Adelaide, David and Liz braved the weather and joined about 12 other brave souls to share the story with them. It was great to discover that we knew many of the ladies (and the one male who accepted the wider invitation to hear us). President, Cynthia Kennedy, thanked us. She then shared a letter written by her grand-daughter which we will take to Lesotho with us. 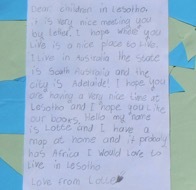 Lotte is 7 and is in Year 2 at a local primary school. Thank you, Lotte for your great letter. Books have been collected from some schools in Melbourne by Chris McEvoy and sent via Books for Lesotho through the Transformation Resource Centre in Maseru to Maliba Lodge in the north of Lesotho. The Lodge is situated within Tsehlanyane National Park and at the end of a long valley with many villages. The owners of the Lodge support programs to sustain the National Park and assist the local people. Agriculture, employment, health and education are perhaps the main areas that the Maliba Community Trust supports. The books have been distributed to local schools together with some steel shelving. We first met Seqao in July 2015 with his primary school maths class in the yard outside their classroom doing revision for exams – during the school vacation period! The 2016 shipment is the first under the Books for Lesotho Inc. name. As we go to print, we have almost packed 6 pallets of books, over half of which have been collected independently by Books for Lesotho. The remainder have been supplied and packed by our partner, South Pacific School Aid (as in the past). This week a pallet load will arrive at our front gate from Chris in Melbourne (see above) to complete the shipment of 7 pallets –to be shipped before Christmas. The books are due to be distributed to schools in Lesotho during March 2017. Two of our Board members, David and Liz, expect to be present at the ceremony. As mentioned above, enquiries about donating books have come from other States in Australia. This follows establishing our website, being recognised at or near the top of the list with a Google search, and listing with GiveNow. We are also on Facebook – “like” us here. We invite schools to consider conducting a book and/or a fundraising drive in support of Books for Lesotho early in 2017 – ready for Shipment #11. Useful resources are on our website. We are hoping to arrange for a transport company to support shipments coming from outside of SA – but such things take time. Give books – We are accepting fiction and non-fiction books (new or used – but only in good condition) suitable for first readers up to Year 12 level. Look here for detailed information. Donate – To our bank account: Books for Lesotho Inc. at Westpac Banking Corporation (Australia), BSB 035-044 Account No: 228285. Please include your organisation or family name with the transfer and also advise us by email including your name and address. Please use GiveNow – the link is on top of the newsletter – in preference to a bank transfer. An operating space for Books for Lesotho Inc. – This will be an urgent issue by year-end. We are looking for a home – at a minimum of 7m x 7m (a large double garage) but with some special access needs – like a truck to load pallets. Please make contact with us if you can help, even with an idea! Interstate/intrastate transport of donated books – Do you have contact with a company which might be able to help bring donated books to Adelaide?